After delivering the atomic bomb to Tinian, the U.S.S. Indianapolis was torpedoed by a Japanese submarine. I compare the nightmare that followed to Christ's agony. 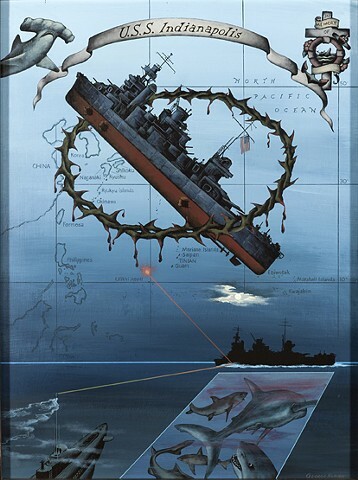 The ship is shown ascending, encircled by a crown of thorns that symbolizes the frenzy of shark attacks that decimated the survivors in the bloody sea.